Bad news for Google: Apple just did in a day what Google couldn't do in an entire year. Apple has managed to sell more Apple Watches in a single day than the number of Android Wear smartwatches sold in an entire year, if market research from Slice Intelligence is to be believed. Throughout the entirety of 2014, all manufacturers using Google's smartwatch operating system (OS) - including Motorola, LG, and Samsung - sold 720,000 units. In contrast, Apple sold an estimated 957,000 Apple Watches on the first day the devices were available for pre-order. These figures do not bode well for Gooogle's app ecosystem. The iPhone has always - with some truth - been considered the "rich man's phone." Apple customers tend to be better off than Android users, spend more on apps and in-app purchases, and accordingly, ad rates on iOS are higher than on Google's OS. This means that iOS is, at least on paper, the more lucrative platform to develop for. But many developers still choose to go "Android-first." Why? Because what Android customers lack in purchasing power (on average), they make up for in sheer numbers. In 2014, Android manufacturers shipped a staggering 1 billion smartphones. That's a milestone that will take Apple years to reach - in the same period, despite having the most profitable quarter of any company ever, the Cupertino company had (relatively) paltry sales of 192.7 million. This truly massive reach is what makes Android such a compelling platform for developers. 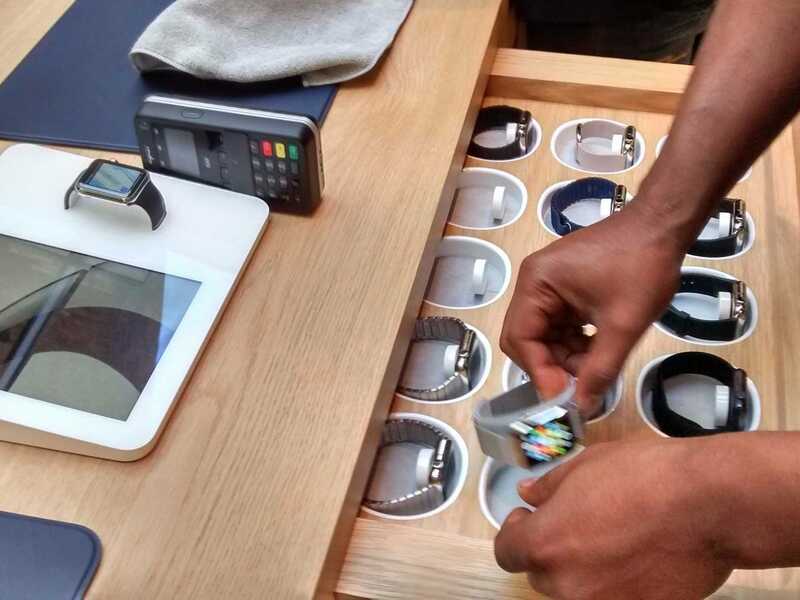 An assistant shows off the range of Apple Watches available at an Apple Store. When it comes to smartwatches, however, the Android Wear OS doesn't even have this advantage. In a single day, Apple has shifted more units than Google's partners did in a year. Even if you believe - as Fortune's Philip Elmet DeWitt does - that Slice's estimate may skew high, it seems clear that Apple is going to win the numbers game on this one. Suddenly, Android on smartwatches becomes the platform with the smaller market share, and without the lucrative userbase to justify prioritising development for it. It's also worth noting that Android Wear and Watch OS aren't the only two smartwatch OS's out there. The crowdfunded Pebble, for example, sold 1 million units in the period between its 2013 launch and the end of 2014. But this variety of options just makes the case to prioritise development for Google's OS even less compelling. This isn't to say that no-one is going to develop for Android Wear. For larger companies who want to maximise their reach, it will be worth building products for both companies' platforms. But when it comes to smaller developers who need to choose carefully where they allocate their resources, Android just lost its one massive advantage.